Techniques by Trish: Welcome to the Halloween/Fall Blog Hop!! Today, I'm part of the Halloween/Fall Blog Hop that is being hosted by Steph at Always Crafting and I'm so excited!!! I have been itching to do another Blog Hop since I did the Back to School Blog Hop so I was HONORED that Steph asked me to be part of this one! :) There will be 11 crafty ladies (including myself) along the blog hop with TONS of great projects!!! And I'm sure there will be some blog candy along the way too! Carol and Barrie, from scrapadabadoo have agreed to sponsor the hop and they have donated a FANTASTIC prize!!! So one person will have the opportunity to win both the Tim Holtz On The Edge Die and a Kaiser Craft Paper Pack (Jades Garden). Now the very special part is the Die will be Autographed by Tim Holtz himself!!! Be sure to check out Steph's blog for details on how to win this fantastic prize!! Now you should have joined me from Melissa's blog but if you've just stumbled upon my blog, your going to want to start at Steph's blog and hop along to see all of the phenomenal projects and blog candy!! Ok so onto my project for the hop! I kept is super simple....its been a bit of a chaotic weekend (Thank Goodness for my m.w.bff, Molly who brought me back down to "Scrapping" earth hehehe) and I was trying to finish a mini I've been working on but it just didn't work on in my favor. So, I created these cute little candy holders to give to trick or treaters!!!! So my project was SUPER simple but I think it turned out pretty cute!! And I think the kids will really like it! This is the first time Jesse (my hubby) and I have lived in a "neighborhood", so we're hoping to get trick or treaters to hand these out to! Now off to the FANTASTIC Sonia from Archiving Angel for another super project! So cute I love the lil candy corn paper doll. Too cute! The kids will love them. Hey Trish you really got in the train again... beautiful project... really nice..
glad your back. love the pillows. lol. great job. hugs. keep up the great work. Wow, for trick or treaters. We get over two hundred. Cheap candy is all we can do here, but that would be fun for friends. these are super cute thanks so much for sharing! love those little pillow boxes for small gifts. i also got my "wedding" cart with my points and used it to make a wedding album for a friend. I love these pillow boxes! Too cute! TFS! Great projects, I will definitely try these pillow boxes. Thanks for the chance to win. Cute pillow boxes :) I'll have to give these a try. I like the pillow box idea. thanks for a chance to win. Your treat boxes are STININ' adorable!!! I need to get a cart that has a pillow box on it! ::: Sigh ::: Some day! cute cute!! love the treat boxes.. getting so inspired!! Great treat boxes! Thanks for sharing! Love the candy holders! They are adorable. I know how you feel about the trick or treaters. This will be my first time too! would love to have you visit, comment and upload your card on my contest page. Very, very cute! I am going to have to get this cartridge now! Those are great! I am glad I am not the only one that buys a cartridge for one cut! Cute project. I hope you made lots of them becuase I'm sure you guys will get many goblins hitting you up for Halloween. Thank you for joining the hop and sharing your project. This is a great idea..I think I may also try this idea for my team at work :) Thanks for sharing and the chance to win. Those are so cute and anyone would love to receive them. Thanks for reminding me that the pillow box is on that cart, I was gonna go looking for one. This is really cute. I didn't know that cart had the pillow box on it... hmmm. Great idea! I love the pillow box!! Your project is adorable...thanks!! I love the little boxes they are very cute and look like they can be used for many things! Cute candy treats! Glad to see you back and posting again. I've missed the videos! Darling candy holders, the kids in your new neighborhood are going to love them. I agree, the kids will love these! That mummy is one of my fave Halloween cuts...just too cute! TFS! Trish these are so cute, your trick or treaters will love these!! These are so super cute! Great job! Very cute candy box! I hope you get lots of trick-or-treaters this year. They'll love this! Thanks for the inspiration and a chance to win new crafting goodies! This blog hop has been a blast! WOW Miss Trish, your projects are FABULOUS my friend!!! I LOVE it!! Thanks for sharing your great treat ideals. I hope you enjoy your first Halloween in your new house and get lots of littls goblins coming to your door. I also love these little boxes! Great project! Very Cute, but you better start making alot more!!! I wonder if any other carts have the pillow box? Very cute pillow boxes.. Thanks for sharing them. I love those boxes but when I went to get the reward they were no longer...oh well, so goes life. Love them anyway and thanks for sharing. Very cute treat holders. I hope you get lots of kids, just one more thing I love about Halloween is trick or treaters. Very cute!! The kiddies will adore them! TFS!! Wow! 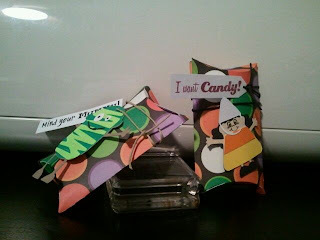 are your trick or treaters going to be happy--candy and neat gift to put them in! I've seen these pillow boxes but wondered which cartridge people used to make them. THanks! Love how you used the pillow boxes. Guess I need that cart now too!!!!! The trick-or-treaters in your neighbourhood are going to be very happy they stopped by your house!!!!!! Great Job!!! I may have to get this cartridge too. I hope you get a lot of trick or treaters. We live in a rural area and in 16 years we have only gotten maybe 2. Enjoy. "Trick or Treat" Okay send some my way. Super cute. Now on to more hopping. I just love the holiday season. What a way to start it out with Halloween. Thanks for the cute project. Wonderful project, trick or treaters will love it. Thank you for sharing. Cute treat holders. I haven't made the pillow box yet from the Wedding Solutions cartridge but I do have it. May give it a try now. Hope you have a better week, I understand when Life gets in the way, happens to me a lot! Super cute, thank you for sharing. oh my gosh Trish you are going to make these for your trick-o-treaters. I applaud you. That is a lot of work. They are adorable treat boxes tho, so Im sure they will be well liked and received. Great project, your neighborhood kids are going to be spoiled. Cute project!! It is always fun to see how we can use nonrelated cartridges for our projects. Those are cute. We don't have too many treaters, so I am thinking about doing treat bags, since I think we may have 5-10. Great job. Such a fun project! I want candy too! Here is my link....looking for new followers too! Those pillow boxes are so adorable! I agree they are very versatile. I love your projects and tips, thanks sooooo much, totally a help for a beginner like me. Thanks for being part of the blog hop! I hope you get lots of trick-or-treaters, because they are going to love your super cute treat holders!!! :) I actually bought the Wedding Solutions Cartridge (during a major sale at Michael's), and I hadn't noticed the pillow box, so thanks for bringing it to my attention! 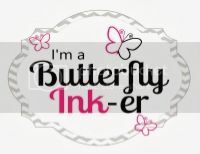 I love, love, love the Scrappy Moms stamp sets, too! Super cute project! The trick- or-treaters are going to love these!!!! I can finally comment since the hop is over... the trick or treaters are going to love coming to your house! Those pillow boxes are so darn cute! Love the paper too! The best birthday gift ever was the birthday I remember the most. I turned thirteen, my mother forgot my birthday so she rushed out to get me a birthday cake and then dropped it on the front porch but made it up with some beautiful turquoise earrings. That was 39 years ago and I still have one of the earrings.